Facial and oculars trauma is the most common cause of seriously vision-threatening crystalline lens injuries, which are frequent consequence of both blunt and penetrating ocular trauma. They often occur due to accidental, sport, assault traffic accidents, car battery explosions, terrorist bombings (3–10%), work-related injuries, and wartime injuries. Iatrogenic posterior dropped crystalline lens can occur during phacoemulsification as it is one of the serious complications of cataract surgery (0.1–1.5% of all cases) and rarely during intravitreal injection (0.006%). Unilateral or bilateral posterior dislocation of the crystalline lens was reported after traumatic or postepileptic seizure. The trauma may involve the bony orbit, the eye itself, or both. They can be avoidable and preventable if safety and security measures are taken. Ocular trauma represented 10–15% of combat-related injuries during Desert Storm Gulf War (9%), Iraq, and Afghanistan wars. Traumatic damage to the crystalline lens has diverse manifestations due to deferent physical mechanisms such as coup-countercoup mechanism of ocular injuries  and equatorial expansion mechanisms. This situation leads to contusion cataracts, capsular breaks, and zonular disruption with resultant anterior or posterior subluxation and dislocation in the case of partial or complete zonular dehiscence. Lens dislocation due to blunt force in anteroposterior direction leads to equatorial expansion, which disrupts the zonular fibers and dislocates the lens. Lens injuries occur in approximately 25% of cases of blunt injury of the globe. B-scan ultrasonography can quickly establish to evaluate internal structures of the globe, media, hemorrhage, choroidal, or retinal detachment. Attention should be paid to signs of increased intraocular inflammation, infection, increased intraocular pressure, vitreous in anterior chamber (AC), or and vitreous traction. A car battery is a type of rechargeable, 12 volt lead-acid, 6 (6 × 2.0 volts: 12 volts) cells made of plates of a lead storage battery that supplies electric energy to a car. Are made up of plates of lead and separate plates of lead dioxide, which are submerged into an electrolyte solution of 38% diluted sulfuric acid and 62% water. This causes a chemical reaction that releases electrons allowing them to flow through conductors to produce electricity through repeated recharge-discharge cycle chemical reaction (Battery Council International; resources)., This repeated chemical reaction generates hydrogen and oxygen by the electrolysis of water within its cells; this gas mixture is then vented from the battery via cell caps. The gas mixture is extremely explosive and should a naked flame or spark be generated in this atmosphere an explosive ignition can occur. The explosion may expel the acidic fluid contents of the cell (sulfuric acid) or may shatter the casing, hurling case and lead fragments about with great force. The potential for serious eye injury to a person working on a battery which explodes is apparent. Car battery explosions ocular trauma has been seen in many car mechanic workshop areas anywhere in metropolitan cities, Khartoum not an exceptional. Injuries range from superficial acid burns to penetrating eye injury, retinal detachment, retinal hemorrhage, and crystalline lens injuries. The cause of the explosions has been ignition of the hydrogen-oxygen gas mixture generated by lead-acid batteries. Most of the car battery explosions facial and ocular injuries happen to persons while charging the battery (26%), dealing with the battery cables (replacing, securing, or tightening); as a result of “jump starting" the battery (19%) or checking and adding fluid to the battery (19%). 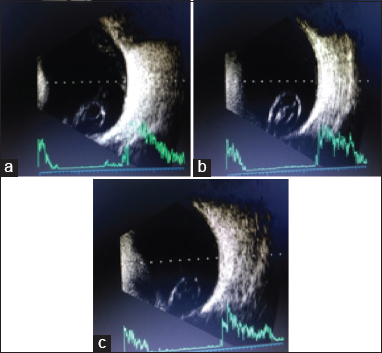 To report a case of right posterior dropped crystalline lens by a car battery explosion ocular trauma, in which the diagnosis was missed on initial ocular B-scan ultrasonography. A 50-year-old Sudanese car's mechanic came to Sudan eye center immediately after right eye trauma. It was happened by a sudden severe car battery explosion onto his face; whereas, he measured the charge of a customer's car battery in his workshop. He had the habit not to wear any protective eyewear or safety goggles  while he is doing his mechanical or checking the customer's cars batteries work. He was referred from the general clinics downstairs to the retina clinic after they did for him the first aid managements and the vital systemic and ocular assessments. A B-scan was done for both eye but did not show much. The patient had severe right ocular pain, photophobia, and blurring of right eye vision when presented to our retinal clinic. On examination, the best-corrected visual acuity of the right eye was hand movement, the left eye was 6/6, cornea was clear, sluggish semi-dilated pupil of about 7 mm size. Minimal watery vitreous was seen in the AC with an intense AC activity but no hyphema. Through slightly hazy media a clear crystalline lens was found dropped inferiorly and toward the temporal side, with some hanging debris; in the posterior vitreous. There was very slight vitreous hemorrhage within slight turbid media. B-scan ultrasonography was repeated but the ophthalmic technician still could not get the picture of the dropped lens. Another scan was done carefully by the reporter himself to document the posterior fresh clear dropped crystalline lens [Figure 1]a,[Figure 1]b,[Figure 1]c. There were no ocular or facial acid burns that usually accompany these accidents. Minor forehead and right upper check contusions were hardly seen. Measures were taken to treat the traumatic intense inflammatory ocular reaction and booked for pars plana vitrectomy (PPV). The PPV was done successfully after nearly 2 weeks. Car battery explosion ocular trauma requires prompt senior and tertiary management to avoid permanent serious ocular damage. Sung EK, Nadgir RN, Fujita A, Siegel C, Ghafouri RH, Traband A, et al. Injuries of the globe: What can the radiologist offer? Radiographics 2014;34:764-76. Lee S, Hayward A, Bellamkonda VR. Traumatic lens dislocation. Int J Emerg Med 2015;8:16. Scott R. The injured eye. Philos Trans R Soc Lond B Biol Sci 2011;366:251-60. Cao H, Li L, Zhang M. Epidemiology of patients hospitalized for ocular trauma in the Chaoshan region of China, 2001-2010. PLoS One 2012;7:e48377. Koh KM, Kim HS, Cho HJ, Lew YJ, Choi MJ, Han JI, et al. Surgical outcomes of 23-gauge vitrectomy for the management of lens fragments dropped into the vitreous cavity during cataract surgery. Saudi J Ophthalmol 2014;28:253-6. Meyer CH, Rodrigues EB, Michels S, Mennel S, Schmidt JC, Helb HM, et al. Incidence of damage to the crystalline lens during intravitreal injections. J Ocul Pharmacol Ther 2010;26:491-5. Izadi S, Stewart RM, Jain S. Bilateral posterior dislocation of the crystalline lens after a head injury sustained during a seizure. Emerg Med J 2007;24:e6. Greven CM, Bashinsky AL. Circumstance and outcome of ocular paintball injuries. Am J Ophthalmol 2006;141:393. Iqbal A, Khan B, Idrees M, Bashir B, Rehman M, Orakza OK. Frequency and pattern of ocular emergency in district Swabi. JSZMC 2014;5(4):696-701. Raymond IC. Ocular trauma in the global war on terrorism. lessons learned from Iraq and Afghanistan. Ophthalmol Manage2014;18:48-50. Banitt MR, Malta JB, Mian SI, Soong HK. Rupture of anterior lens capsule from blunt ocular injury. J Cataract Refract Surg 2009;35:943-5. Kubal WS. Vascular and other emergencies in the head; imaging of orbital trauma; RSNA. Radiographics 2008;28:1729-39. Pasternak J. Trauma of the Crystalline Lens – US Army Medical. Available from: https://www.ke.army.mil/bordeninstitute/published_volumes/./OPHch10.pdf. [Last accessed on 2015 Aug 12]. WordNet 3.0, Farlex Clipart Collection. S.v. “Car Battery." Available from: http://www.thefreedictionary.com/car+battery. [Last retrieved on 2015 Nov 28]. Linden D, Thomas B, editors. Handbook of Batteries. 3rd ed., Ch. 23. New York: McGraw-Hill Companies, Inc.; Printed and Bound by R. R. Donnelley & Sons Company; 2002. Siebert S. Ocular trauma from lead-acid vehicle battery explosions. Aust J Ophthalmol 1982;10:53-61. Rodriguez JO, Lavina AM, Agarwal A. Prevention and treatment of common eye injuries in sports. Am Fam Physician 2003;67:1481-8. Hoffman RS, Snyder ME, Devgan U, Allen QB, Yeoh R, Braga-Mele R; ASCRS Cataract Clinical Committee; Challenging/Complicated Cataract Surgery Subcommittee. Management of the subluxated crystalline lens. J Cataract Refract Surg 2013;39:1904-15. NHTSA (National Highway Traffic Safety Administration); National Center for Statistics and Analysis – Research & Development-400 Seventh St. SW-Washington, DC 20590. Injuries Associated With Hazards Involving Motor Vehicle Batteries. “Research Note" US. Department of Transportation; July, 1997.